I am posting photos of some of my container gardens and favorite plants in honor of our war veterans on Memorial Day. These pots are bright, bold and strong, like our military heros! 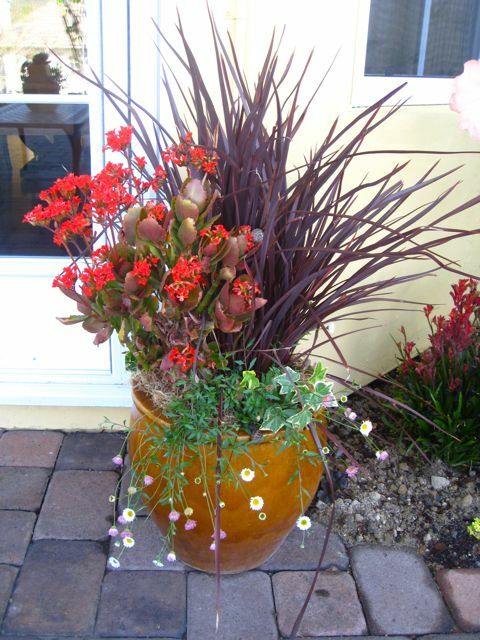 One of my favorite "dry combinations" for this low water container garden includes dwarf, red Phormium, coral Kalanchoe, cascading needlepoint ivy and billowy, Erigeron "Santa Barbara daisy." This low maintenance combo pack a whallop year round! 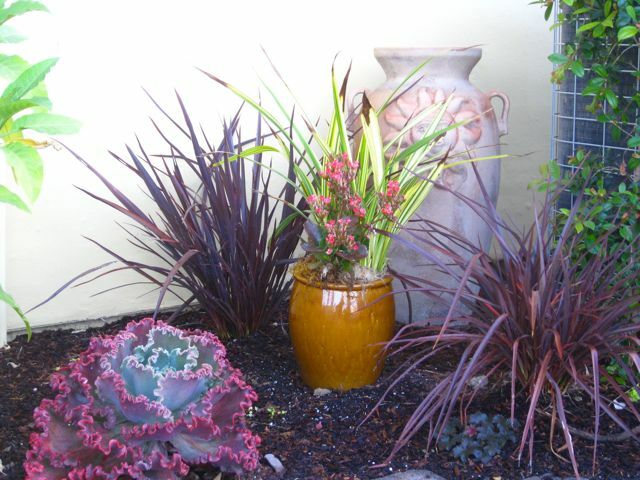 I like how the butterscotch-colored glazed ceramic pots set off the burgundy and brown colors in this small garden. I don't have a large variety of plants, but the foliage-centric design will provide color year round. A fragrant Brugmansia will grow and fill in the "naked wall area." The "pasta bowl- sized" echeveria doubles as a "living sculpture." This close up photos reveals my attempt to screen the air conditioner. Once the Eugenia and other plants grow in, I will succeed! 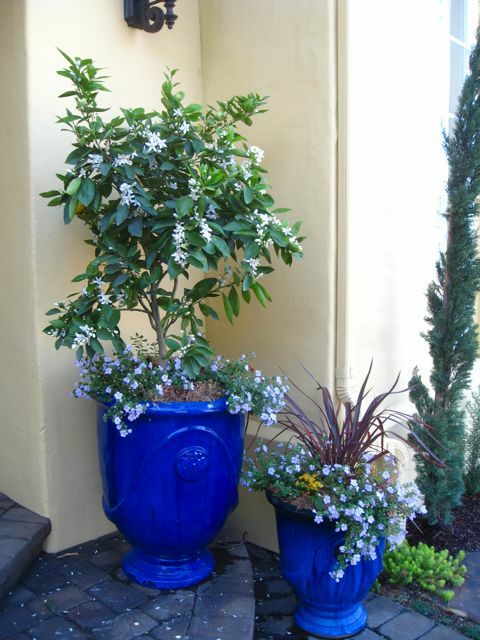 Regal, blue urns with dwarf citrus tree (left) and red Phormium (right). I used a trailing periwinkle blue Bacopa to punctuate the blue sizzle and sprinkled yellow "gold coin" for contrast. Soft and bold at the same time, the valiant-red color of the Lotus plant reminds me of the bravery and sacrifice of our veterans. No pastel colors in this garden. I'm wearing my Army t-shirt today and attending our community Memorial Day parade. This is Edith Shain, the young nurse who was kissed in this famous photo taken during the celebration of the ending of World War II in New York. When I see our war veterans riding in the parade, waving to the crowds, its hard to imagine how young they were when they served our country. They may be considered "old people" now, but to me they are still handsome, courageous and strong! Thank you for your service, I dedicate these gardens to you. Thanks for visiting. 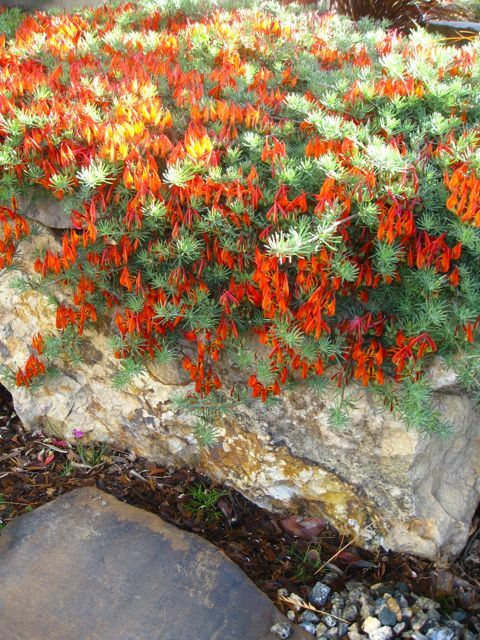 In the hottest climates, Phormiums appreciate some shade but are considered full sun plants. I find that the Phormiums I have in containers in my patio (some shade) look the best. really like your container with the Phormium. Will the Phormium take shade or partial shade? As always it is great to hear from you. I enjoyed my Memorial Day parade and family day and hope you did too! The tribute to those who fought for our freedom is wondrous. Nice tribute to our veterans, Shirley. 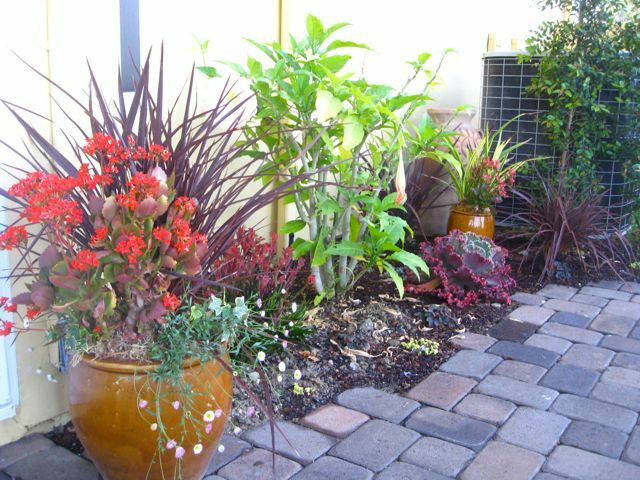 And I love the way the Phormium looks with those pavers. Hi Kathryn, Thanks for dropping in today. The parade was fun and very touching. I always get “hit” when I see the veterans on the floats. I had tissue and the sun dried the rest of the tears! You were in the service too weren’t you? Thanks for your service to our country! As far as the plants are concerned, I do like underscoring the color of my containers with a matching colored plant. I love your combinations too. Your containers are just beautiful. I do love the blue bacopa with the cobalt blue pot. I didn’t even see the AC so you did a good job hiding it. I second the salute to vets everywhere. Love you in your Army T!